Hopefully with the addition of more cabins they don’t have to turn the speed down resulting in a capacity gain of zero like happened to Bridger at Jackson Hole. No comment on that but does anyone know if they still run Revelation as two separate sections with cabins turning around at the mid? When I skied there back in the day, cabins made the full trip but the gondola had two different names – Anticipation and Revelation. Then I heard they split it up but unified the name. Go figure. They do run as separate lifts. There’s a priority loading queue if you came from the lower gondola, but you have to get off and back on again. I think it helps since very few skiers go all the way to the bottom, so it speeds up loading on the main section. 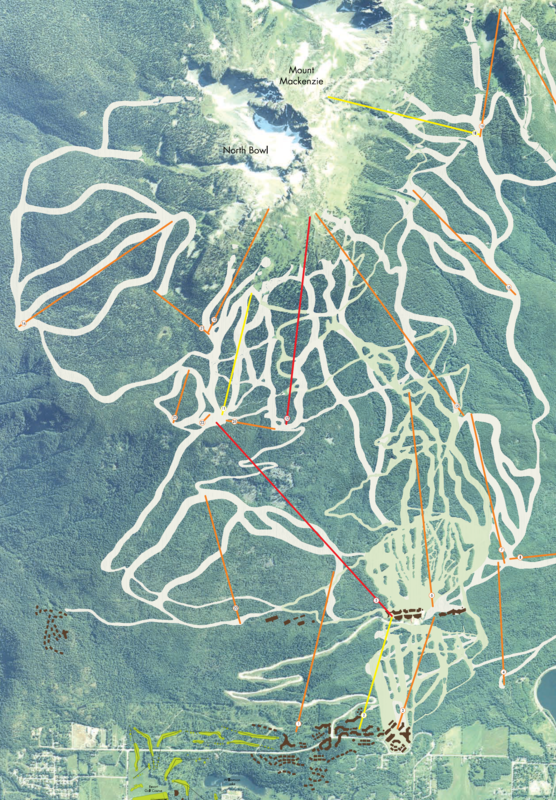 On Killington’s two stage Skyeship Gondola, they usually have both stages connected with cabins making the full trip. They send up empty cabins from the bottom to allow people to load at mid. Sometimes they will run them separately if there’s a problem with the link or if they’re running on diesel. I think it works better to have the stages connected because there are fewer people getting in and out at mid. I expect cupcake (I love the name) to be built by either skytrac or leitner-poma. Confirmed Leitner-Poma Alpha. I never assume these days! Peter, do you know that Cupcake follows alignment 25? I was sort of assuming it would be 11 as Revelstoke recently mentioned that was one of their three priority lifts. I’m not certain. My thinking was 11 looks too long for a 3 minute ride time. Have you been told that the new lift is a 4C, and not a D4C? Chair 25 from the 2007 master plan isn’t even on the 2018 master plan. The new 25 is a 5,000 ft lift that runs from the top of 6 to below the top of the Stoke. Chair 11 is about 3,300 ft long, so if the new lift is detachable, then I’d imagine that it’s going to be 11. Lift 11 looks to be about half as long as The Stoke. Maybe a 3 minute ride on a detachable but definitely not on a fixed grip. Assuming a design speed of 400 feet per minute, Cupcake would be 1200 feet long. It will be exciting to see if Revelstoke is able to complete more lifts and expand terrain in the future. Adding the other lifts they listed as a priority would nearly double their lift fleet. It was also interesting to read in the master plan how much capacity the lifts originally had, how much they are designed for, and how much capacity was added to them in 2017. All lifts started with an hourly capacity of 1800, except The Stoke which was 1820. The gondola sections have a design capacity of 2800 and the chairs have a design capacity of 2600. The lower gondola had 6 cabins added and how has an hourly capacity of 2177. The upper gondola has 18 cabins added and now has an hourly capacity of 2371. The Stoke had 21 chairs added and now has an hourly capacity of 2207. The Ripper did not have any chairs added.